This is the easier of the two snack ideas. So easy, guys. Plus, there is a chance you already have both ingredients in your refrigerator. I often do! 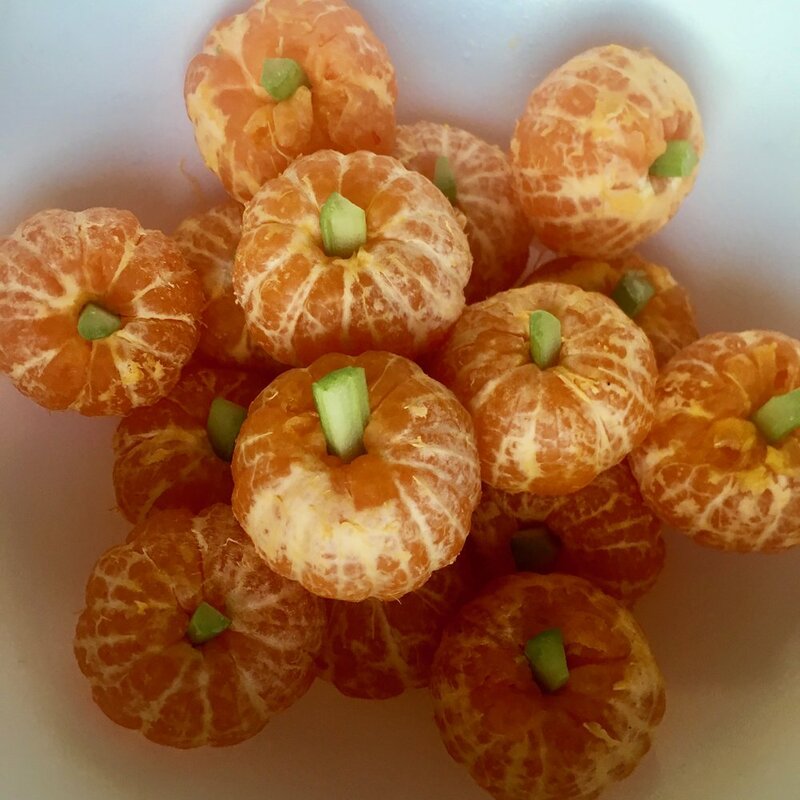 You just need mini mandarin oranges (aka Cuties) and some celery. Slice the celery into thin strips and then make 1 inch (or so) segments. Stick the celery stick into the top of the orange. Give it to your kid(s). The original recipe came from one of my favorite blogs, Skinny Taste. However, she made them with chocolate cupcakes - here’s the link her original recipe. 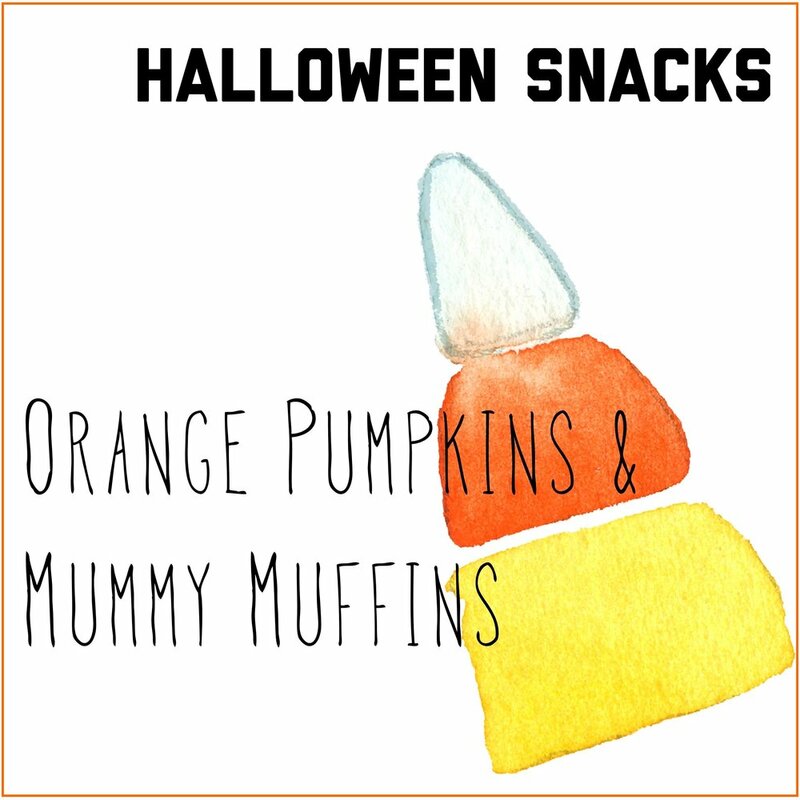 Since I was giving these to a bunch of toddlers, I was hoping to cut back on the sugar a little bit and go with pumpkin muffins instead. I’m sure either would be a big hit! For my muffins, I used a recipe from another favorite blog, Sally’s Baking Addiction. I made her Whole Wheat Mini Pumpkin Muffins to keep them on the healthier side. I made them into small muffins, not mini since I figured it would be hard to frost mini muffins. You’ll see she has a note on the bottom on how to make them regular size muffins. I also cut back on the amount of chocolate chips just a wee bit knowing I was going to add some frosting on the top. Bake up some muffins or cupcakes. Recipe Suggestions: Chocolate cupcakes or Whole Wheat Mini Pumpkin Muffins. Make some frosting: Combine 2 cups confectioners’ sugar, 1/4 cup melted butter, 1 teaspoon vanilla and about 1-2 tablespoon boiling water. Start with just 1 tablespoon boiling water, and add more as needed to get a good consistency - firm but will squeeze out of the piping bag easily. Put the frosting into a piping bag or ziplock bag. If the latter, just snip one corner and then you have a DIY piping bag. Squeeze the frosting onto the top of the cupcakes or muffins. Tip: have some of the lines cross, almost like an X, to get the mummy bandage effect. Place mini M&Ms on as eyes (be sure to have the M that’s on one side face down) to make eyes. Happy Halloween! I hope it’s frightfully good!